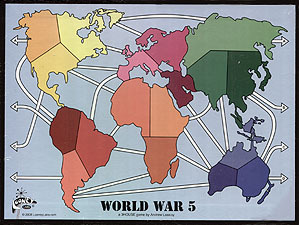 World War 5 - a strategic war game from Looney Labs. If you grew up playing Risk and Diplomacy like we did, and you enjoyed these classic games but were frustrated because it took ALL DAY to play... we've got the game for you! We have redrawn the map of the world into 6 evenly-sized land masses, and have balanced the international connections between the continents. The result is a vastly easier and fast-playing world conquest board game, Andy Looney style.